Microsoft released strong quarterly results, which showed good growth in cloud, server and devices. Last month, we predicted that Microsoft sold about $2 billion worth of Surface Pro 3s at retail over the past three, three-and-a-half months. So the interesting number in the quarterly report is the Surface recording $908 million in revenue for Microsoft. That may look like we’re way off, but it actually might be pretty close. It’s not clear whether Microsoft reports net revenue or gross revenue for hardware — the latter is basically units x retail price which is how we got our $2 billion, the former is units x wholesale price. Given how Microsoft has traditionally been conservative in the way they account for revenue, it’s likely that Microsoft’s number is revenue net of retail markups. Retailers and wholesalers typically have a 50% markup. Even though there is no hard and fast rule for pricing merchandise, most retailers use a 50 percent markup, known in the trade as keystone. What this means, in plain language, is doubling your cost to establish the retail price. Because markup is figured as a percentage of the sales price, doubling the cost means a 50 percent markup. For example, if your cost on an item is $1, your selling price will be $2. Fifty percent of $2 is $1, which is your markup. So our $2 billion estimate is really more like $1 billion on Microsoft’s books. However, not all sales were through retail channels; Microsoft sold direct too, which would not incur the keystone. I don’t know what the percentage sold direct is, so let’s assume it’s 20%. If that’s the case, we arrive at (80% x $2b x 50%) + (20% x $2b) = $1.2 billion. 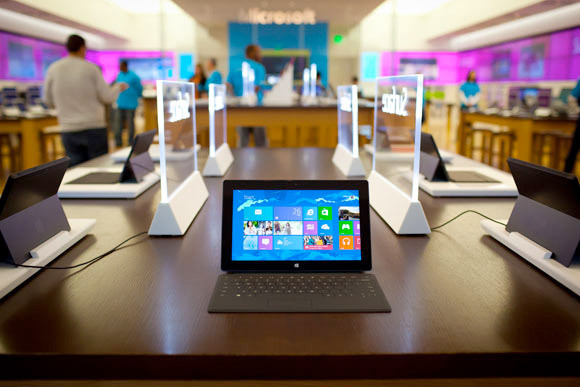 Moreover, our estimate was total Surface Pro 3 sales. Microsoft had reported $409 million revenue from the Surface Pro 3 in the previous quarter, which means our estimate should translate to $800 million this quarter. Now we’re under the official $908 million number, but the latter includes Surface 2s and accessories. Our initial $2 billion estimate had only included the keyboard. All in all, we’re probably not too far off! The only way to really know is if Microsoft would just release unit numbers sold.